Get the latest info on Transformers Video Games Devastation, Earth Wars, Fall of Cybertron and more. Includes trailers and development updates. While back by Novermber 2018, we heard of a collaboration between Kaspersky lab (known by their anti-virus software) and Bumblebee. By that time, it was not clear what it was about, only that it seemed to be focused on the Russian market. Now, courtesy of 2005 Boards member, we can share for you images and details about the Transformers: Bumblebee Defender Mobile Game By Karspersky Lab. It’s a simple but entertaining role-game where you play as a teenage boy/girl who has just moved with their family to a small town, where Blitzwing and other Decepticons have landed and even spotted by the locals. You have to keep the story flowing by interacting with other characters in chat-rooms. No action, just conversations and decisions. According to the description of the game, it offers you a 17-chapter story, and more than 15 different endings. The game is available only in Russian, no other language available, but it’s available in both Google Play and App Store for free. Check out some images and a short gameplay video, after the jump. 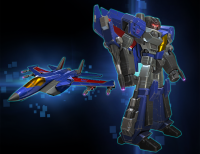 Kabam have delivered their April update to Transformers: Forged to Fight players, and we have a very nice addition to the ranks: G1 Thundercracker. Jetfire is already available to be added into your ranks of playable characters, and is coming in a design based on his Leader class Combiner Wars toy incarnation. You can add Thundercracker to your ultimate squad since April 18th at 10AM PDT. The full Bot Intel Report can be found here at the official Forged To Fight website. You can also read on for the full profile and stats after the jump. Don’t forget to join to the discussion about this character on the 2005 Boards! The official Forged To Fight Website is giving their players the heads up of their Forged To Fight 2nd Anniversary Special Update & Event. NEW FEATURE: A new Challenge Mission has arrived! Conquer this new challenge to gain exclusive rewards. But hurry! You only have 2 Weeks! Map 3 difficulty and rewards have been increased to provide an engaging challenge for the top level Commanders. Map 3 layouts and encounters have been updated. This means all new enemies, bosses, and buffs to overcome! Map 1 and 2 Bosses and Mini-Bosses have been updated. A number of Bots have been updated. Bots receiving updates include: Hound, Mixmaster, Jetfire, Kickback, Starscream, Galvatron, Grimlock, Megatronus, Grindor, Dinobot, Sideswipe and Bumblebee (Dark of the Moon). Do you want more? Log in right now to receive a free Matrix Of Leadership relic! Click on the bar to join to the ongoing discussion on the 2005 Boards! Good luck gamers! TFW2005 member Alexander Fedorychev closely watched the recent Ghost in the Machine! live stream from the Transformers: Earth Wars Space Ape Games crew and discovered concept artwork revealed for upcoming characters Jetfire and Starscream. Play the clip below, remember to download the game for free from your preferred app store and then join in the discussion on the 2005 boards! Video game developer Certain Affinity is hard at work to develop a brand new game [tentatively] titled as Transformers Online. The company is working under wraps ever since Hasbro awarded them the licence back in mid-2017. Certain Affinity’s Toronto branch is working collaboratively with their Austin headquarters to bring this game to you. Transformers Online is confirmed to be a Third-Person Shooter very much like Transformers: War For Cybertron and its sequel Fall Of Cybertron as well as the recently popular Fortnite by Epic Games. The company is mostly known for their contributions towards the multiplayer aspects of Call Of Duty and Halo franchises. Also, judging by the developer, Transfomers Online is most likely a Console/PC game. We expect an announcement (and our first look) during New York Toy Fair 2019. Stick with TFW2005 for more info. 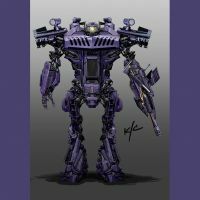 N-iX Art Production Studio has uploaded some piece of unused Transformers concept art via Arstation. We have a very interesting group shot of characters inspired by the classic G1 style. We have Optimus Prime, Jazz, Megatron, Bumblebee and Skywarp in modern and stylized designs that we are sure will please your optics. Additionally, we have individual images of Megatron, Skywarp, Dead End, and Brawl. All of them easily recognizable as their G1 counterparts but Megatron, who is mainly green and gray with no traces of the alt mode or his iconic fusion cannon. According to the description shared by N-iX Art these are: “Some of the concepts we did a while ago for a cancelled project. Inspired by Transformers G1 designs”. There’s no detailed information about this project, but the galleries have a “Game Development Studio” tag, so we may think they were planned for a video game. Check the images after the jump and then sound off on the 2005 Boards! Artist Ken Christiansen has been sharing several pieces of concept art he made for the Transformers: The Game from 2007. This game was part of the many Transformers live-action movie products back in the day. We have several images of characters from the video game (some of them even were made into toys eventually) together with some comments from Ken Christiansen about each of them from his Facebook account. Transformers: The Game Triple Changer Shockwave Concept art: “Here’s an oldie, but one of my all time favorite designs. Time stamped August, 2006. Wow, that’s getting old. So happy to see this character appear in G1 form in the #bumblebeemovie . Scroll through to get some purple action, along with black color variations for the game. Went from a ‘Super Howitzer’ to an Apache copter”. Transformers: The Game Dirtboss Concept art: “Dirtboss? That’s a name! The third character I designed for the game, which turned out to be another toy! But not for Transformers : the Movie, he came in 2009 as part of the Revenge of the Fallen line. That made me happy, because he was my favorite drone design, a little scrappy guy, so I was glad to see him get a toy version. Swipe for concept art, initial concept sketch, and shots of the figure”. Transformers: The Game Payload Concept art: “The second character set I designed after the initial 3 for the game, this was the kickoff, and turned out to be another toy. This one I got to do some graphics and I really got into it, made a stock armored car service logo, with a Decepticon symbol thrown in there. As fun as this one was to do, I think I like the toy even better. Except for the thing on his back. Owners know what I’m talking about. Swipe for concept art, initial concept sketch, transformation logic, and shots of the figure”. Click on the bar to see all the mirrored images on this news post and then sound off on the 2005 Boards! Kabam have delivered their December update to Transformers: Forged to Fight players, and we have a very nice addition to the ranks: G1 Jetfire. Jetfire is already available to be added into your ranks of playable characters, and is coming in a design based on his Leader class Generations toy incarnation. The full Bot Intel Report can be found here at the official Forged To Fight website. You can also read on for the full profile and stats after the jump and a great showcase video below. Don’t forget to join to the discussion about this character on the 2005 Boards! Jetfire joins the Fight and once again he doesn't know who to trust. Play now to add him to your team! To make it up to you, we are giving away in-game items (1,000 Shanix, 200 5-star shards and 200 Fuel cells). Please close the game completely and tap on the link below to claim the gift. http://bit.ly/2Svlp3V Feel free to share the code with your alliance and friends, as it works once for every player. It will work until Monday, December 10th. Download the game for free from your preferred app store and then join in the discussion on the 2005 boards!